Sauerkraut “la choucroute” is a traditional German and Eastern European dish which has been adopted in Alsace and Lorraine particularly, but enjoyed in restaurant throughout France as a typical French dish. There are many ways to prepare it, and today, I’ll tell you about my favorite – “la choucroute garnie à la bière”. I especially chose ingredients that you can easily find in the US. This French Sauerkraut recipe serves 4 to 6. 12 ounces dark beer – Read Camille’s article on French Beer Vocabulary. Cut the bacon into small pieces about one inch long, place them in a 4 quart saucepan, and cook on low heat until the bacon is translucent, about 6 minutes. Dice the onion and add it to the pan and cook on low heat until it is translucent, about 10 minutes, being careful as you do not want the bacon to get crisp. Drain the sauerkraut reserving the juice, and then add the sauerkraut, beer, brown sugar, caraway seed, salt, and the bay leaf to the pan. Stir until well mixed and bring to a low boil, reduce the heat and let simmer for 1½ hours. Next taste the dish and if you desire a more sour taste, add back the sauerkraut juice to taste. Finally grate the carrots, remove the bay leaf, and add the grated carrots to the saucepan and simmer for another hour. This dish gets better with time, so it is best to prepare it a day in advance. Use a good dark beer such as one of my favorites “Rochefort 10”, a Belgian beer that is produced by the monks at the Rochefort Abbey. In fact I propose that you use two bottles of beer, one for the saucepan and one for the cook! 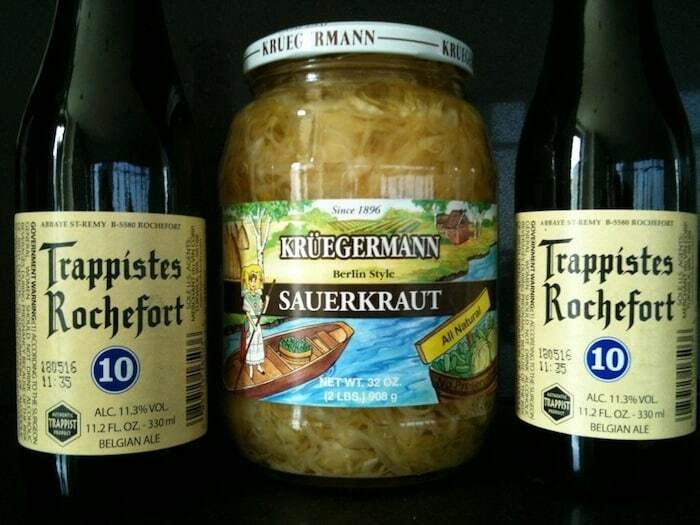 If possible use raw sauerkraut made of only cabbage, water, and salt. I like bacon, so sometimes I use a full pound of bacon. Serve with sausages and boiled potatoes. Bonjour tout le monde! 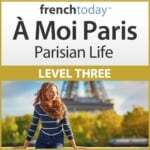 Je m’appelle John L. I decided to learn French in preparation for a long hike in the Swiss Alps. My hike was fantastic and my French skills were extremely useful. To be prepared for my next adventure to a French speaking region, I continue to take weekly French Skype lessons with Camille. She has helped improve my French tremendously.